What I really like about Typology theme is that it has only the absolutely necessary set of settings, without the extra fluff, to create uniquely designed WordPress blog. The preferred theme for every writer. If you’re simply a writer, and you don’t have a clue about how to designing landing pages, if you simply want to write. Share with the world what you feel inside your hearth, you need to start a blog. Expressing your emotions and feelings through words is the best way to clear your mind. But that’s not everything. It’s proved that by blogging you can earn a living. You can support your family. Reach wider audiences. Do what you want with your life. A lot of people think that creating a site is hard and it requires coding skills. But thanks to WordPress, starting a site is the easy part. The writing part is the hard one. Also, there is one additional thing that might distant you from your desired success: the design of your site. If you’re not sure how to craft your site to fit your needs and present your content in the best possible way, you need to learn to code. Or, get the right WordPress theme, which is not that easy as it sounds. Here, in this detailed review, I will show you one minimal WordPress theme that will transform your content and make it shine. Yes, shine like a diamond. I present to you: Typology – Text Based Minimal WordPress Blog Theme. This theme is created for bloggers who don’t have time to design their sites. It’s for people who are looking for simple, yet powerful solutions for their content. In this detailed review, I will show you the features of this theme and a step-by-step process to configure it. 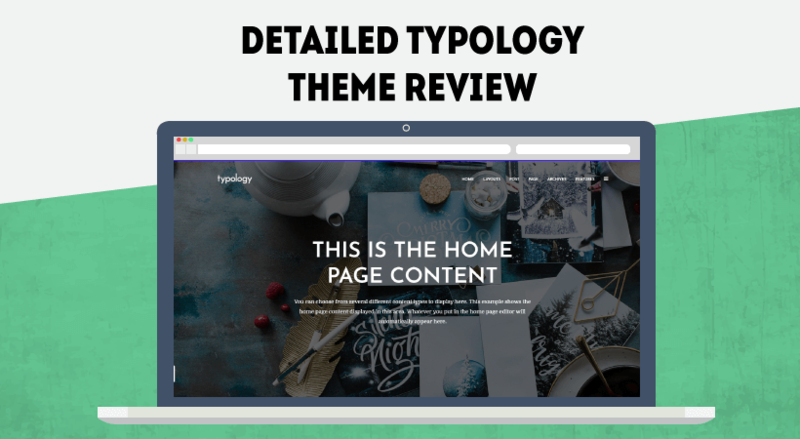 Put simply, if you’re a blogger and your primarily writing content, I will highly encourage you to check Typology WordPress theme. The authors of the theme, Meks, are advertising the theme as such that doesn’t even require featured images. it’s designed to really make your content great with the least amount of effort. Well, obviously you need to write the blog posts. It’s probably the only theme on the market that is putting so much focus on the actual content. To be honest, it works. The installation process of the theme is quite similar to the other WordPress themes I’ve reviewed. It will basically help you get started with the theme. Force Regenerate Thumbnails: This plugin allows you to delete all old images size and really regenerate the thumbnails for your image attachments. Meks Easy Ads Widget: This allows you can create an unlimited number of ads inside your WordPress widget. Plus additional options to customize ads for your needs. Meks Easy Instagram Widget: This allows you to implement your Instagram photos in your WordPress site. Meks Flexible Shortcodes: This plugin for those who want to add some nice additional elements inside their post/page content. Meks Smart Author Widget: Display your author/user profile info inside WordPress widget. Meks Smart Social Widget: Display more than 100 social icons inside WordPress widget. Meks Time Ago: This plugin will allow you to easily change your post date display to “time ago” format. For example, 1 hour ago, 2 weeks ago, 5 months, 4 days ago, etc… Several options are provided to suit your needs. Of course, at any given moment you can disable or uninstall a plugin if you don’t think it’s necessary. You don’t necessarily have to do this. Only if you want to add the predefined settings by the authors of the theme. It took probably 3 seconds the screen to load. The imported button will appear and once you hover over it you will see Re-Import. We’re all set with the demo. Let’s first see what settings are included in this minimal WordPress theme. Keep in mind that if you’re looking for more steps from the author of the theme you can press the Learn More button. This will lead you to their knowledge base site. Dismiss the notice once you’re ready with this screen because it will only annoy. The Branding menu allows you to change the logo of the theme. Retina Logo (2x): Retina logo for retina displays. Custom logo URL: If you want to load logo from 3rd party page. For now I’m going to use the logos from the demo content. Theme style: Choose how your content should appear over the header section where the image is usually placed. The actual image in this section explains it all. Header/cover background color: Obviously, the color of the background color. Header/cover gradient: You can make this gradient if you’re a fan. Cover background media: If you want, you can upload an image or a video that will appear instead of a simple colored background. Basically, you can style every section of your site and assign different than the default color. The next two tabs are holding the header and the footer options. Inside the Header menu, you can choose what to include and also how the menu, logo, and the burger menu to be arranged. It’s cool to have this as an option. You can, for example, add links to your social media profiles. In this section, you can also adjust the height of your header, whether or not to enable the sticky header and what would be the orientation. Don’t forget to save when you make changes. The footer menu is super straightforward, you select the layout and go to Appearance > Widgets to decide what to add. Probably you will need only 1 column. It’s best to keep in clean and simple. Besides the basic settings we saw above, there are a couple of additional configurations that will help you tailor the theme to fit your needs. Decide what font you want for which section and do it. It’s that simple. Ads section is where you can add banners inside your website. It’s really cool to promote a service or ad your affiliate links. In between posts inside your blog section. You can also block ads on specific pages and also on 404 pages if you like. Next, is the Misc. menu. More string is what to be displayed after a excerpt of the article finishes. Use built-in theme gallery or disable this if you’re using another solution. You can disable admin editor styling and remove fonts and colors from Theme Options. This will speed up your site. Display scroll-down arrow in cover. Really cool feature. Words to read per minute count. The count of each post, how many minutes you need to read it, is measured depending on the value you put here. If you want to translate the theme, you can use the settings here: Typology Options > Translation. All major elements can be easily translated from this section. If you’re not using a specific element of the theme, it’s best to disable it. This will speed up your site. As I mentioned in the beginning, the theme includes only the basic options. By default, you can’t create a landing page, at least not the way you can with Elementor or Visual Composer plugins. Still, the authors of the theme allow us to configure our Home Page. Don’t make the text too long though. Cover area displays: This here will say what to be displayed on your homepage. This is the reason I mentioned to make it short. Enable Cover section on first page only. Basically, if you don’t want this same piece of setup to be run on the other pages. Intro section displays: After the intro, you have the option to add a bit more text. The theme is setup to display posts after what we have above. The above is the main section and what you see below is what comes after first paragraph. Pretty decent for a homepage created in less than 3 minutes. 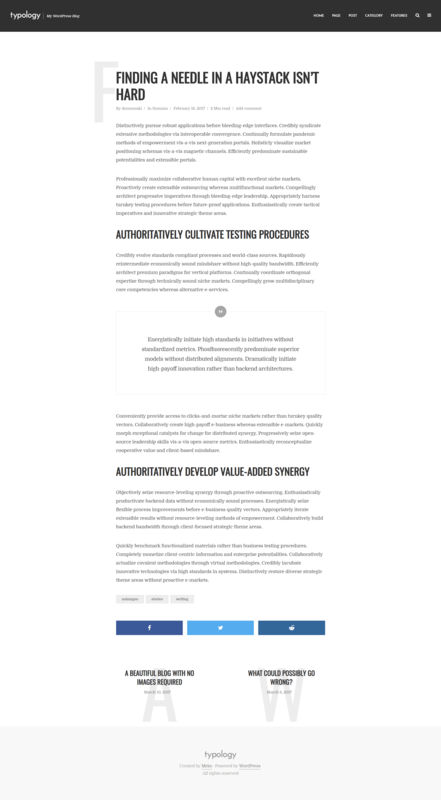 To be honest, Typology theme has one of the best blog layouts I’ve seen so far. It’s well arranged and it has a perfect composition with the most important options. You can choose from 3 different layouts. Should you, or should you not, display the featured image. Share buttons, the position of the buttons and also social media channels. Well, it can look even better if you add a cover image. The price of Typology theme is 49 USD. It’s a one time payment. You get all the featured updates of the theme + 6 months of support. Currently, this template has close to 1,800 downloads. Even though it’s not a lot compared to the big boys, it’s a decent amount of sales. You can get the theme by going to this link. Even though I love the idea of only the essential features, it would be nice if they, the authors of the theme, allow you to create some kind of a landing page. I absolutely love the theme. If you’re a blogger and if you don’t want to waste time configuring your site, you should definitely consider Typology. With just a few clicks you will be able to have everything ready for your content. It’s an extremely beautiful theme that will surely WOW your visitors. If you’re still looking for a theme and the content is the most important aspect of your site, give Typology a try. I will love to hear your experience with this theme. Have you ever used Typology or the other themes created by Meks? 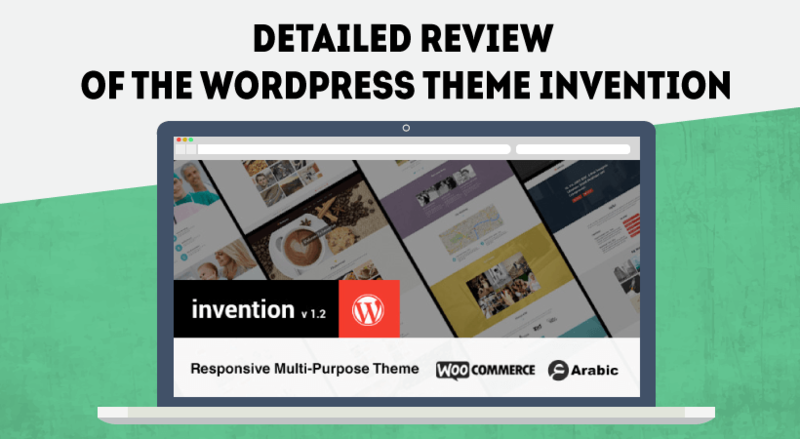 next post: Detailed Uncode Theme Review – Is it really that impressive?